Remanufacturing is the process of rebuilding a product and either replacing or repairing worn out parts with new ones. The remanufacturing (reman.) process is a vital industry that is environmentally friendly, reduces scraping of unused metal, and allows customers to get back their original unit that may vary from what OEM specs dictated. The ability to remanufacture existing units guarantees a sustainable supply of parts that promotes recycling and eliminates the wasteful scraping of unused parts. Unique to remanufacturing is the ability to replace key components that comprise the internal guts of a unit, which are crucial to the durability of the reman. unit, such as diaphragms, seals, o-rings, control valves, poppet valves, etc. Due to the stringent reman. process, rebuilt units are essentially equal to OEM units at a fraction of the cost. Most reman. units are accompanied by warranties that mirror OEM warranties to insure customers are receiving a quality product built to OEM specs. Buyers of reman. units should inquire about the quality of internal components used by their rebuilder. We demand only quality; therefore, we only use the same internal components as was equipped with the original power brake units. 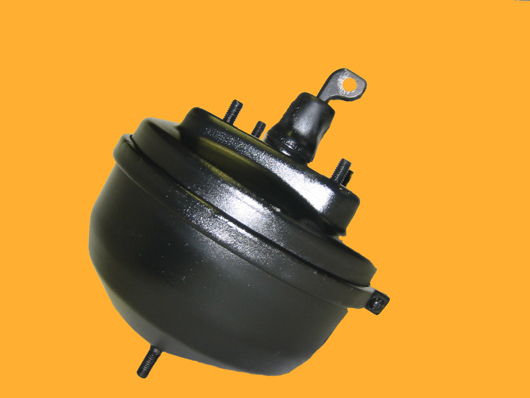 At Reman Brakes we do not believe in sacrificing the quality of our boosters by using inferior replacement parts. We use only AC Delco repair kits in hy-powers and Bendix repair kits in hydro-maxs and hydro-boosts. We feel confident that our competitors who sell these remanufactured units for less are not going the extra mile by using the brands that so many in the automotive aftermarket industry have come to trust. Using higher quality replacement components results in higher costs for us, but we believe the expense dramatically reduces the number of defects and reduces the amount of down time for our customers. While the reduced cost of remanufactured parts is significant (30-50%), the quality of these parts is equal to that of the new and the actual return rate is typically less than two percent, which is on par with that of most new parts. In the area of quality and reliability, remanufactured parts are proven to equal and quite often exceed the original manufacturer specifications. From a global perspective, remanufactured auto parts are environmentally friendly. The role and impact that remanufactured products have played in our business is almost immeasurable. By offering a full compliment of remanufactured products, that are in almost all cases equal to or perhaps superior than the new equivalent, our company is able is able to be extremely competitive in all or our markets. There ís no question that our company would not be where we are today without a full compliment of quality remanufactured products. Remanufactured components play a vital role in the automotive aftermarket and have evolved rapidly to the changing marketplace. This evolution has allowed manufacturers to continue to offer the price driven consumer, most critically, the DIY’er a low cost alternative to new components.